Over the past few years, we have grown more conscious about the unhealthy life-styles we are having. Working from an office chair for 9 to 12 hours per day, no physical activity and poor diet choices will prove to have a hefty tool in the end. Food is probably the main thing that can be addressed. Food quality decreased a lot and the only way to control a diet is to start cooking at home. This means investing a bit into the right type of appliances. One item that should not be missing from any kitchen is a food steamer. Food steamers are now more popular than ever. Because of the way they cook food, fewer nutrients are lost in the process. Also, it means cooking without using oil. While the number of recipes that can be cooked with a steamer might not be impressive, the health benefits make it worth the effort of having limited choices. There are still some great dishes that can be made with a food steamer. The way they work is as intuitive as possible. Water is being heated up, steam is generated and the food sits right on top without being emerged into the water. Unlike regular steamers that are used over a pot, electric food steamers can cook more food at once. They are also quite easy to clean and do not create a mess in the kitchen. For today, we will have a quick look at 10 different food steamers of various sizes and from a wide price range. With these things said, let’s jump right into our list of recommendations for the top 10 best food steamers in 2019. 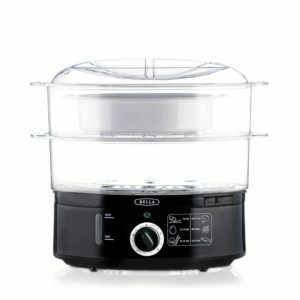 What Matters The Most When Picking A Food Steamer? Breville BFS600XL is a great addition to any kitchen. It offers a healthy way of cooking food for a reasonable price tag. The model comes with 3 steam chambers and a large LCD screen and simple controls. To make it easy to use, the food steamer has a water level indicator and a useful keep warm function. Build quality is quite impressive. The chambers are made out of the glass while the body of the steamer uses stainless steel. Trays can be removed individually and have removable bases. The reservoir can be drained only by unplugging the unit and just flipping it upside down over a sink. Not draining it and leaving it to sit for several days will cause the water inside to smell unpleasant and promote the growth of mold which means it will be even more difficult to clean. 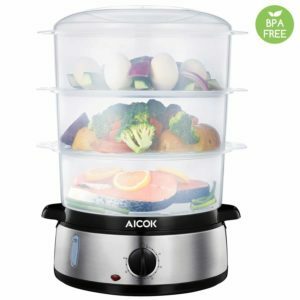 Aicok food steamer is one of the few models in our list that state clearly that it is made from BPA-free materials. It is a powerful 800-watt machine that heats up fast and can cook for up to 60 minutes. The timer of the steamer is very intuitive and has an auto shut-off feature. 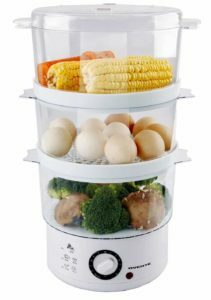 In terms of capacity, the food steamer has 3 chambers with removable lids that can cook about 9.5 quarts of food. Cleaning the steamer is quite easy as the baskets are dishwasher safe and draining it is also quite simple. The steamer has 3 chambers placed on top of each other. Steam travels through each layer and for the first 2 levels, food gets cooked properly. The third layer has a more difficult time cooking food properly as it does not get enough steam. There is no way around this issue. Rosewill electric food steamer is a good and safe option that does not cost a lot of money. It is a simple steamer that uses BPA-free plastic baskets and a simple base that features a timer adjusting knob. Using the steamer is very simple and can cook food for up to an hour. It also has an auto shut-off mechanism when the water tank is empty. 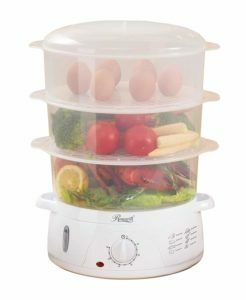 In terms of practicality, the steamer has 3 baskets and heats up very fast. It takes about 40 seconds for the steamer to reach the appropriate temperature. Heats up in just 40 seconds. The steamer is made almost entirely out of plastic. The base enclosure is made of plastic and so are the baskets. On the upside, everything is BPA-free which means it is safe to use but all that plastic is not very reassuring in terms of longevity. 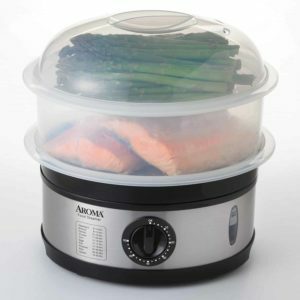 Aroma Housewares food steamer is a good pick for the ones that are on a tight budget. 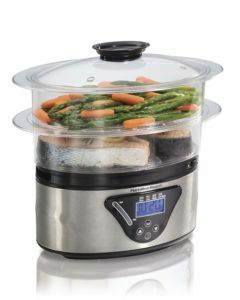 The model is a small 5-quart food steamer with a 60-minute timer and auto shut-off function. Heating up takes about one minute and the water indicator will make it easy to see when it needs to be refilled. In terms of cleaning, the steamer is easy to disassemble and the plastic recipients are BPA-free. They are also dishwasher safe and quite resilient to wear and tear. The plastic used for the baskets tends to bend a bit because of the heat. This causes them to be difficult to assemble them back. They do get back to their original shape but over several hours. If the plastic would have been more resilient to heat, the steamer would have scored higher on our list. Ovente FS53W offers great value for the money. It is an efficient steamer with 3 compartments and a capacity of 7.5 quarts. 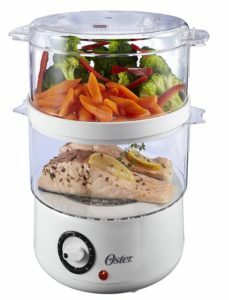 The steamer has a 60-minute timer and an auto shut-off feature when a timer is up or the water tank becomes empty. The containers used have removable bottoms and fit on top of each other securely. Cleaning the containers is also quite simple as they are dishwasher safe and shatter-proof. Draining the steamer is also simple and the water tank is very easy to access. The steamer is a 400-watt model. Most other steamers are twice as powerful. What this means for the end-user is that it will take more time than usual for the steamer to reach the right temperature to start cooking the food. Gourmia GF300 is a great pick for the ones that are on a limited budget. This compact and easy to use steamer has 3 individual chambers and it is powerful enough to heat up fast and start cooking the food in just one minute. 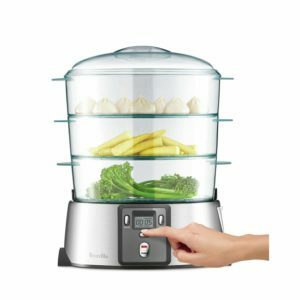 The steamer can be used on almost anything including vegetables, rice, and meat. The steam is evenly distributed in the chambers while the water tank is very easy to fill and drain. The timer is easy to adjust and can be set to a maximum of 60 minutes. The steamer is not as large as some would be tempted to think. It was made to be compact but looks the same as 9.5-quart ones. The containers are quite small but this does enable it to cook food faster since the steam reaches the food faster and there is less food to maintain at a very high temperature. Black & Decker HS1050 manages to stand out because of its reliability. 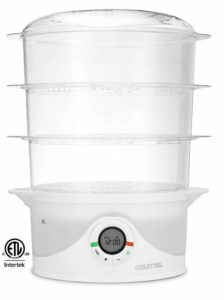 The model is a 7-quart food steamer with 2 individual baskets that can be stacked. Inside the bundle, Black & Decker included a small rice bowl and an egg nesting basket. 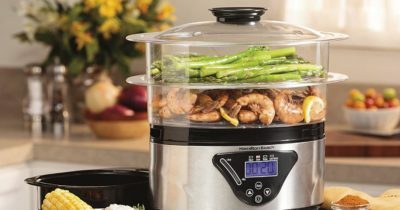 Unlike other steamers, this model has a larger water recipient that offers 75 minutes of continuous usage that can be adjusted using the small timer dial. One useful feature is a special opening that can be used to add spices. Some might argue that the instructions manual is not needed as it is very straightforward but that is not entirely true. An instructions manual should contain additional details about cooking times for various types of food and how to properly clean and maintain the steamer. Sadly, the manual that comes with this model contains very little useful information. BELLA food steamer is an inexpensive and decently sized cooking machine. 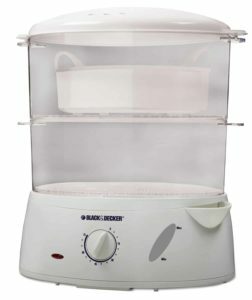 The model is a 7.4-quart steamer with two main compartments that have removable lids and bottoms. As a bonus, the manufacturers also included a small recipient for grains or eggs. The model has a simple dial that can be used to adjust the timer up to 60 minutes and a see-through water level indicator. As for cleaning, the steam baskets are dishwasher safe. All parts that touch the food are also BPA-free. The build quality could be improved. In terms of functionality and reliability there are no issues but the timer adjustment dial, for example, feels a bit flimsy. Also, there are other parts made out of plastic that feel a bit cheap yet the machine works flawlessly. Hamilton Beach digital food steamer is one of the best-selling products on our list. It has a simple design with a stainless steel base, digital controls for the timer and a large water level indicator. The model uses two chambers to steam food and has an auto shut-off function when the water level is low. All the containers in the set are made to be easy to clean and are dishwasher safe. Last but not least, the steamer also includes an egg basket and a very useful booklet. The steam baskets are not very impressive. They are still much better than what most other models use. The walls are thicker and they are fairly clear but some edges might feel rough and the plastic feels like it can shatter easily. Oster CKSTSTMD5-W is one of the best picks in our list as it offers excellent value for money. The model is a simple steamer with a 60-minute timer and a capacity of 5 quarts. It includes 2 transparent bowls with a removable lid and removable base. Both of them are dishwasher safe. In terms of maintenance, draining is just as easy as filling the steamer. Last but not least, the steamer has an auto shut-off feature when the water level is too low. The fact that the steaming bowls have thin walls will mean two possible issues. The first one is that they can break easily if they are dropped. A second issue is with heat transfer. A good amount of heat will be lost because of the thin walls instead of being properly retained inside to help cook the food faster. Heat up time: This indicator is not that important. Usually, a food steamer heats up in about 1 minute. Some will take longer than that but when cooking something for let us say 30 minutes, another extra minute or two will not matter at all. Capacity: The capacity of a steamer can vary from 5 quarts and all the way to 9.5 quarts. For a single person, the 5 quart ones should be more than enough. A large family will probably need the largest model they can find. Water tank capacity: The amount of water that the tank can hold usually dictates for how long it can steam food continuously. When the tank is low on water, the machine will stop. The vast majority of food steamers have timers limited to 60 minutes. There are a few models that can steam continuously for up to 75 minutes.